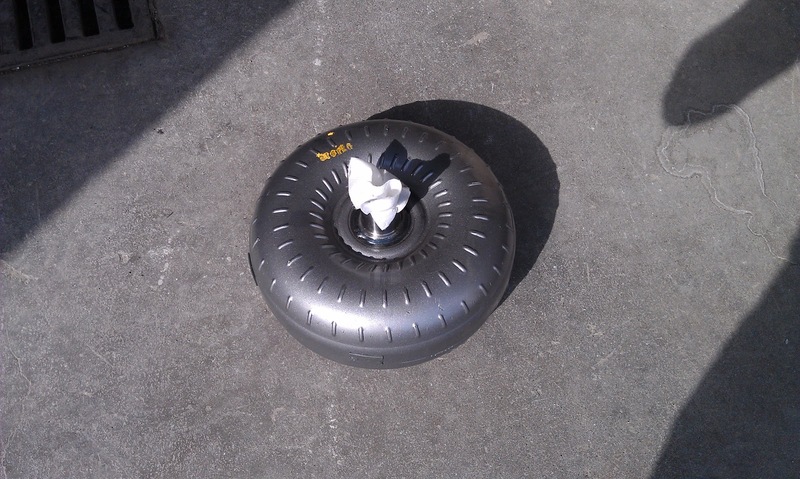 When we were taking out the plastic liners from the wheel wells we noticed that both were cracked. 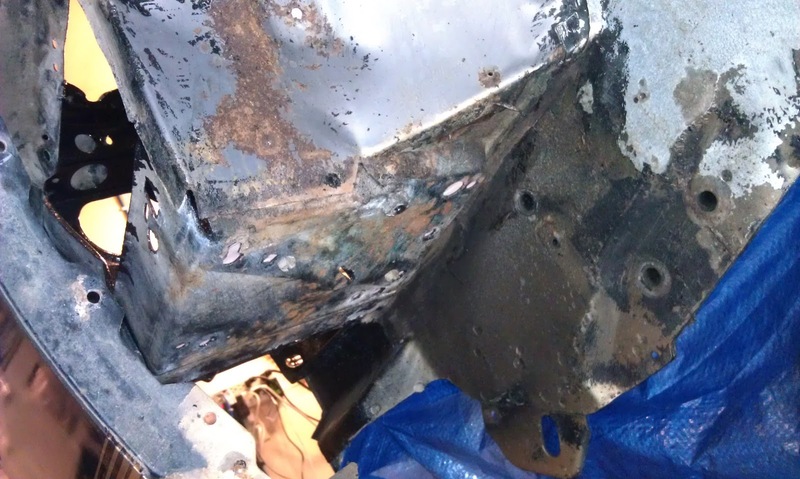 The passenger side was in much better shape than the driver side. I decided to see if I could find replacements. 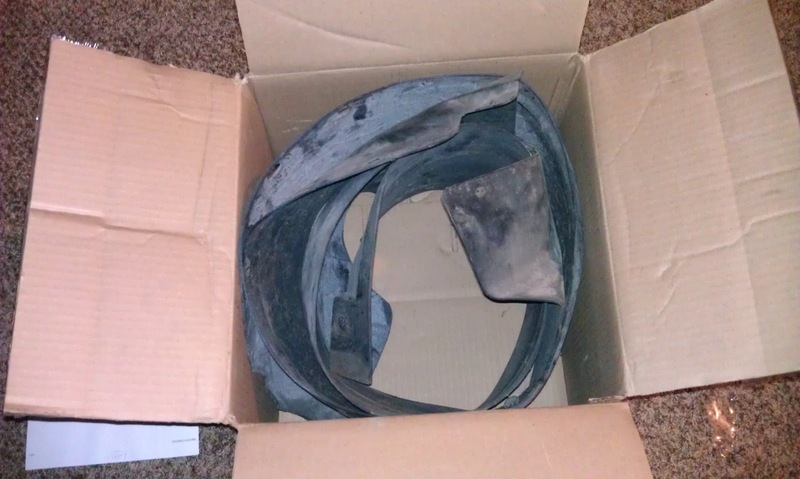 There are no new replacement liners being made, but I did find a used set that was in good condition and cheap. They arrived today and, although the box was just a little bit bigger than what you would need to ship a basketball, they were both in there. The picture below illustrates how they managed this feat. The first thing Jonathan noticed when we got started this morning was some of the underbody was still damp (specifically around the frame areas). 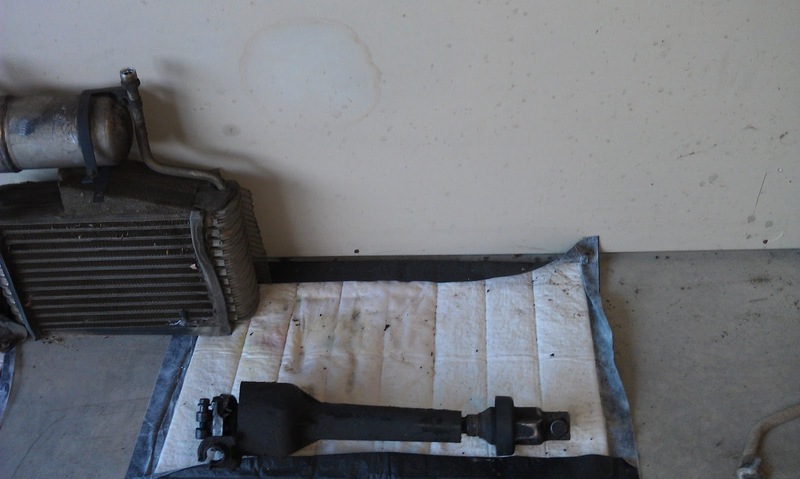 He took the heat gun to these areas to speed up the drying process. Jonathan got called into work this morning, so unfortunately we did not get started on the car until noon. 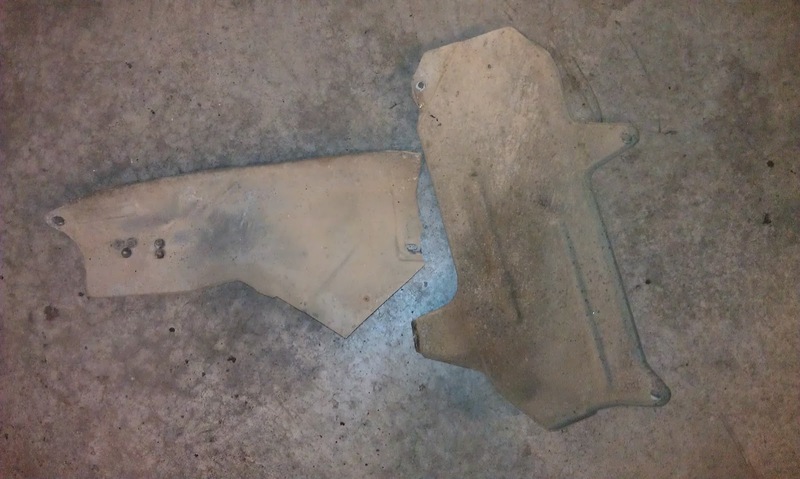 These are the heat shields Jonathan removed yesterday. 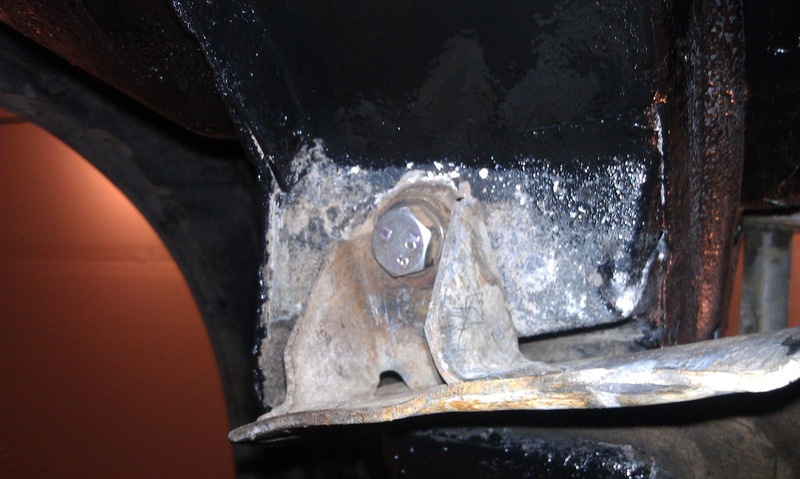 I noticed when we were cleaning the underbody that one of the bolts securing the K-member to the frame was missing. This is why we deliberately left parts of the underbody unpainted. 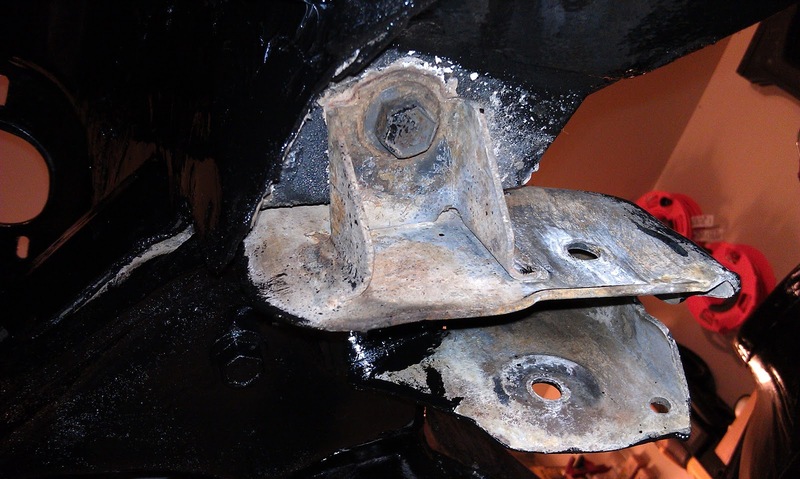 The picture below shows the driver side with bolt intact. The Engine Bay Is Completely Coated With POR-15! The engine bay is finally done! The upper portion of the bay has been top coated with the UV resistant BlackCote and the underbody portion with three coats of POR-15 black. The underbody portions of the video were taken while rolling on a creeper so they are a little shaky. Take note of the awesome contrast of the treated underbody versus the untreated at [3:22] in the video. Also you will notice a few interior areas of the underbody that still need to be painted. I highlighted a couple of these areas starting at [3:37]. 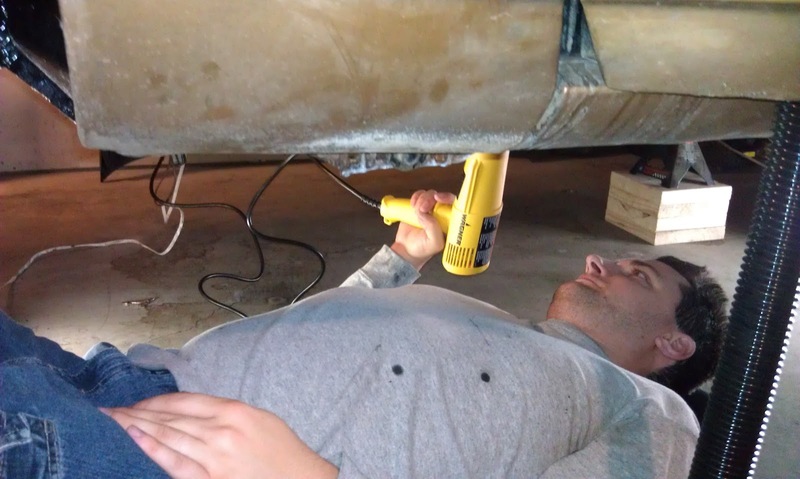 Jonathan decided the first thing to do this morning was brush the seam sealer on the wheel wells. We still have to put the seam sealer on the interior of the car too, but on the inside it can go on top of the POR-15 since it will be covered by carpet. The seam sealer is gray, so Jonathan wanted to put it on the wheel wells first and then cover it with the black POR-15. 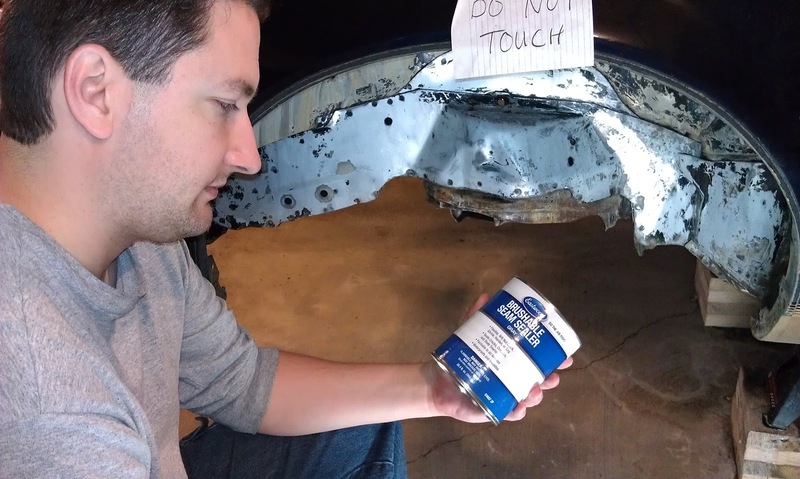 This is a picture of Jonathan reading the instructions on the Eastwood Brushable Seam Sealer can. After work today I started on the remainder of the driver side wheel well. I also treated the underside of the engine bay tray with some POR-Strip as pictured below. I did not have a lot of time to work on KITT tonight, but I wanted to get something started. I am off work early tomorrow and want to have something to jump right into when I get home. I started on the driver side wheel well. 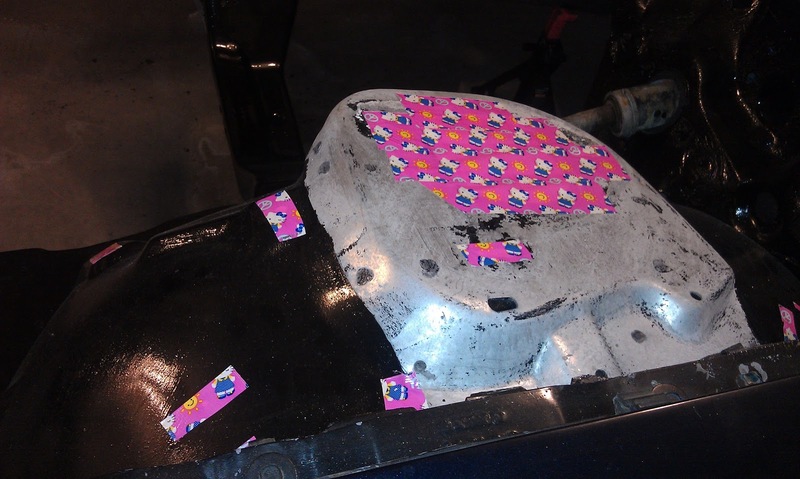 I used my Hello KITTy duct tape to seal off the holes in the wheel well so that POR-Strip will not leak out into the engine bay. KITT's transmission has been rebuilt and is back in town. Troy is going to store it for me at the garage until I am ready to install it again. Thanks Troy! I paid for the transmission this afternoon and snapped a few pictures. I will be adding a complete specification sheet to this post in the near future. Help Support Project: K.I.T.T. with cool Project: K.I.T.T. merchandise! I ordered my first major conversion parts tonight. I ordered a season 3 front nose and rear stone guards from Knightdesigns.com. Estimated completion time is six months. These parts are all custom made, one at a time by hand. We also placed yet another order from POR-15. We ordered another six pack of black POR-15 and another tube of POR-Patch. POR-15 is offering free shipping through Labor Day. Our trial run with the paint booth was a success. I just want to add a fan and a filter to remove the particulates from the air inside the booth. Sara and I laid the tarps out on the floor widthwise. The actual measurements of the tarps were 7' 4" x 9' 6". I needed the 9' 6" to span the 8' ceiling to floor height, so we overlapped the tarps by 4" making 7' side panels. We taped the seams on both sides with two rolls of duct tape from the top of the tarps down eight feet. This allowed us to have panels at the bottom to make corners on the floor. Once our tarps were all taped together as one piece, we put up the corner eye hooks and made our frame. I deliberately centered the booth around one of the 200 watt light bulbs in the garage. We then installed the remaining eye hooks so the walls were snug. I used two of the eye hooks in the center of the paint booth as points to hang parts for painting. I secured the open seam with clips to make a doorway. Once the side walls were up we pulled the 10" x 10" tarp underneath and folded the excess length of the side panels outward and set cinder blocks at each corner. 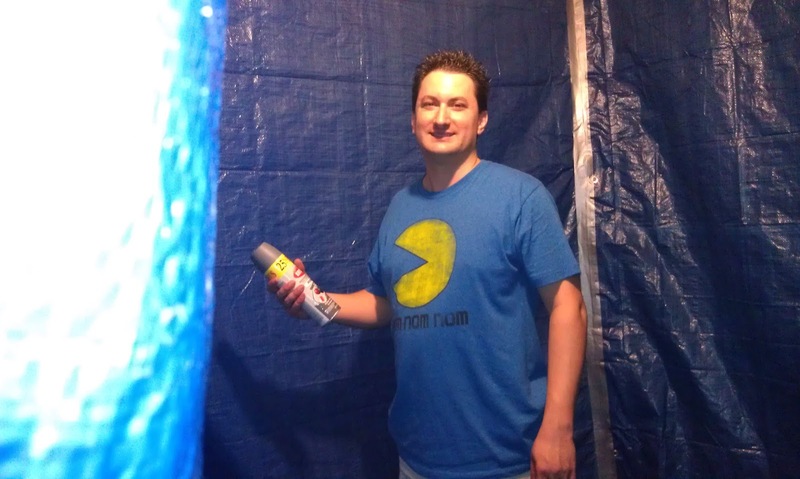 The paint booth is easy to put up and take down. After we finished with it tonight we took it down, folded it up and put it in a plastic tub for storage until our next painting project. I took before and after videos of the engine bay underbody. I recorded the videos while rolling under the car on a creeper so the footage is not the smoothest, but you will get to see exactly what I saw. The video below was recorded before we had done anything to the underbody. 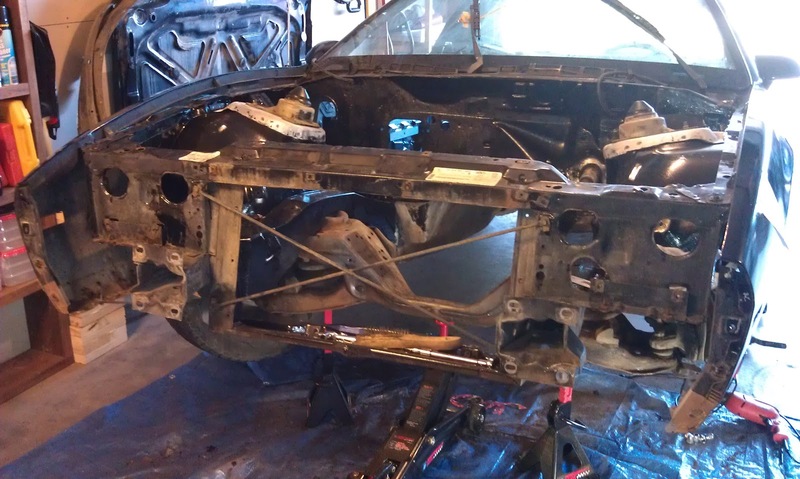 This is basically what the car looked like underneath when I purchased it. This video was recorded after hours of scrubbing with wire brushes, scrubbing with MarineClean and prepping with Prep and Ready. There are still a few areas I want to rough up further but it is pretty much ready to paint with POR-15. Project: K.I.T.T. will be on hiatus until after Labor Day. We started this morning at 8:30AM. Jonathan took the drill with the wire stripping wheel and went over the bottom of the K-member. There was some overspray from the wheel well lining that he wanted to remove. Pop Quiz: What is missing in this picture? Let me start off by saying that the chips and salsa I had tonight were definitely the highlight of my evening! 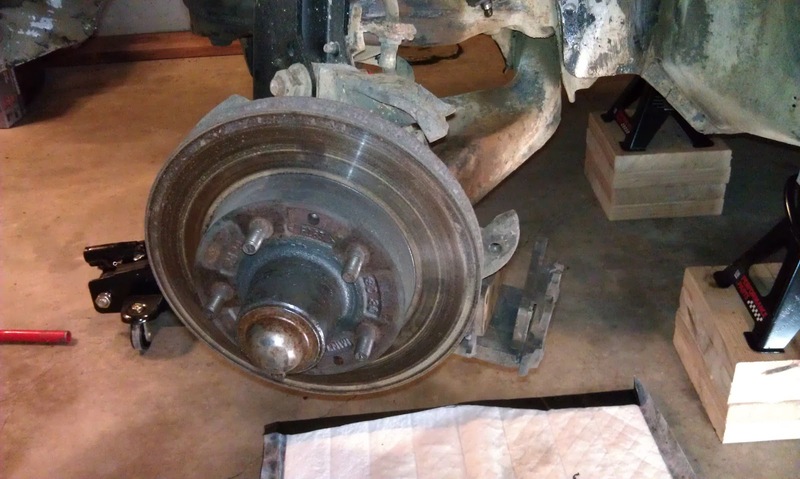 After work I started by removing the caliper, followed by the wheel bearing dust cap, rotor and shield. 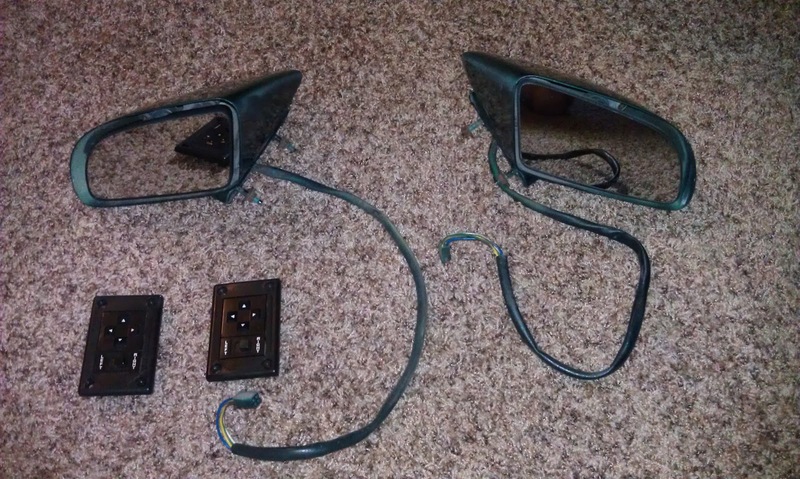 My power mirrors, switches and bezels arrived today! They are in great shape. Here is an update on what I have been doing the past few nights. Sara's dad assisted me with taking apart the motor mounts so the inside rubber mount can be replaced. 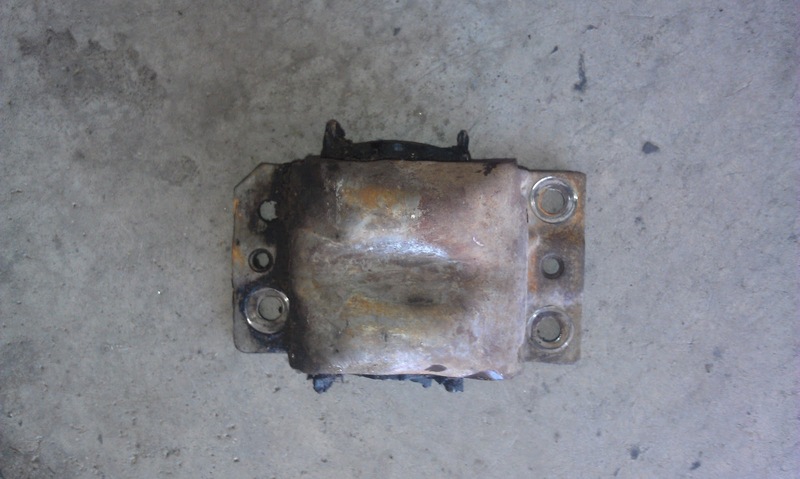 This is a two piece metal bracket riveted on either side. This bracket bolts directly to the K-member. It was necessary to drill the rivets out in order to separate them. I used a 31/64 drill bit and some cutting fluid. We started this morning by brushing the K-member and the front of the car with wire brushes.